Abstract: While nothing has yet hit the commercial markets as far as "Webpads" go, this should give an idea of what to expect from companies like S3 for instance. It's nearing on a month from when Transmeta finally broke the silence and showed us all what they were up to. While nothing has yet to hit the commercial channels that uses the Crusoe line of processors, this series of photos gives a good idea of what to expect in a whole new line of "Webpads." The first one's will no doubt arrive from S3, but by years end there may be several versions on the market. Right now we can only wait and see. 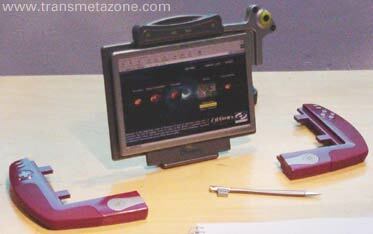 Entitled the "Quanta," we can seen more of the features of this 'webpad' prototype from Transmeta. 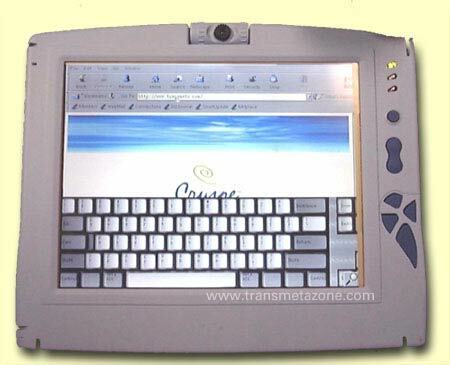 Specifically the touch screen keyboard, which pops for typing. Note however that it appears be be cut of on the right side. Perhaps a laptop's keyboard would have been a better model for this application. On the top of the screen there seems to be a small digital camera capable of rotating 180 degrees. In this picture of the "Quanta," the handwriting recognition capabilities are hinted at. The lack of words on the screen may indicate that the software hasn't been perfected yet however.The pen no doubt serves a dual function, one as a 'mouse' type pointer device and the other for writing. The first Newton's to appear on the market so long ago had a lots of difficulties with handwriting recognition - to the point that one programmer called the software a "random word generator." 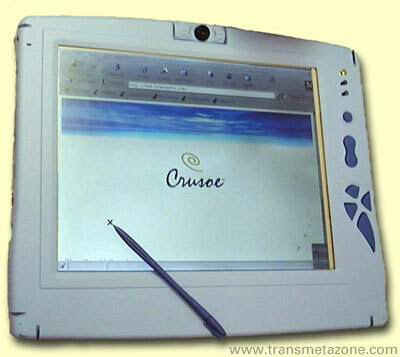 Technology has advanced significantly from 1993, but getting a computer to adapt to human writing has always been a challenge, hopefully one that Transmeta has the handle on. Two different colour concepts of the same S3 "Daytripper" prototype, and below another functioning prototype with integrated digital camera.